Let the summer book fairs begin! It’s been a few years since we have managed to get to the Wayzegoose at the St Bride Institute. It’s a grand place in a pleasant location, and though that end of Fleet Street is usually pretty quiet on a Sunday, this weekend may generally prove to be busier than usual. We shall be at our table for the full day on Sunday, that’s from 11 in the morning until 4 in the afternoon, with our newer books and some of the older ones found while tidying up the stock cupboard. Maybe some type for sale as well, and I expect if last time is anything to go by, going home with a heavier load than we arrived with. If you are unfamiliar with the St Bride Library, take a look at their website for details, and if you can make it on Sunday, do stop by for a chat. 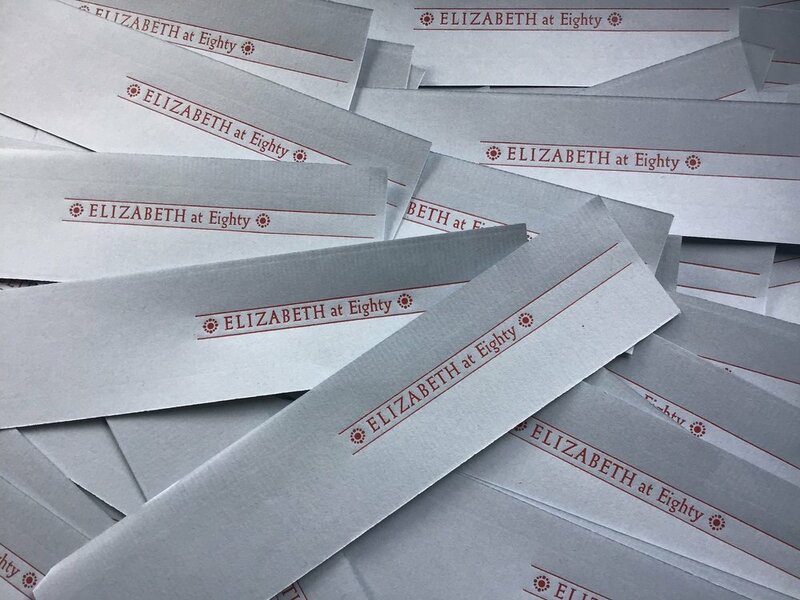 Our next book, Elizabeth at Eighty, is finished on the press, labels and all, so in addition to preparing for the 'goose, Kathy has been busy sewing and glueing so that sixty sets of the readied book block could be driven by Mike to Roger Grech at his Papercut Bindery in Shipley. In the meantime, a spine label has been printed, trimming of which will occupy a few evenings. It will be added to the finished books as the sign that they have been checked and hand numbered, and there will, in late-Georgian fashion, be a spare label tipped onto the inside of the back board. Not so often found nowadays it seems, so many have been hoovered up by collectors or destroyed by philistines, but I still enjoy looking for these labels in inter-war hardbacks, occasionally teasing them off the endpaper to use on the spine when the original has been made unreadable. They are also useful if you have a slip-case made for a book - a spine label on the slipcase nudges the reader to turn the book away from the damage of sunlight, which is why Incline Press books tend to be labelled on the slip-case when one is needed to hold the boards a bit tighter than many tipped in plates usually allow. And with the Elizabeth labels finished, I’ve turned to completing a small commission for the forthcoming House of Illustration exhibition of the work of Enid Marx. I met her in the later years of her life when I was just starting Incline Press, and printed several books and some other bits and pieces for her. 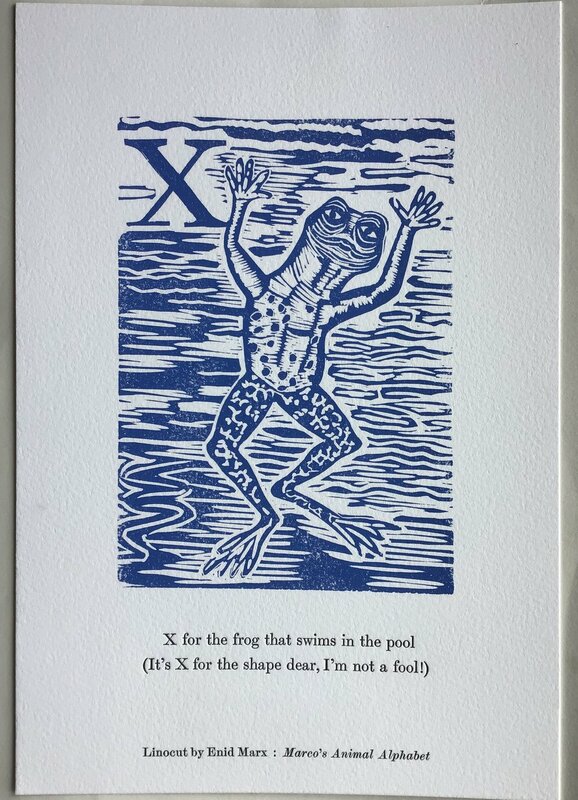 After the last, Marco’s Animal Alphabet, I kept the linocut of 'X for the frog' expecting to print a second advertising leaflet, but the book sold out before that was necessary. The block stayed wrapped and forgotten in a wood-type case here until the House of Illustration got in touch to see if I had anything they could add to the exhibition. The cut itself will go back to the Estate when the exhibition is over, so this will be a rare chance to see the original work. As well as an edition of the frog for their shop, I have also printed Marco’s two-colour Muscovy Duck, a free-standing piece rather than one produced for a book illustration. 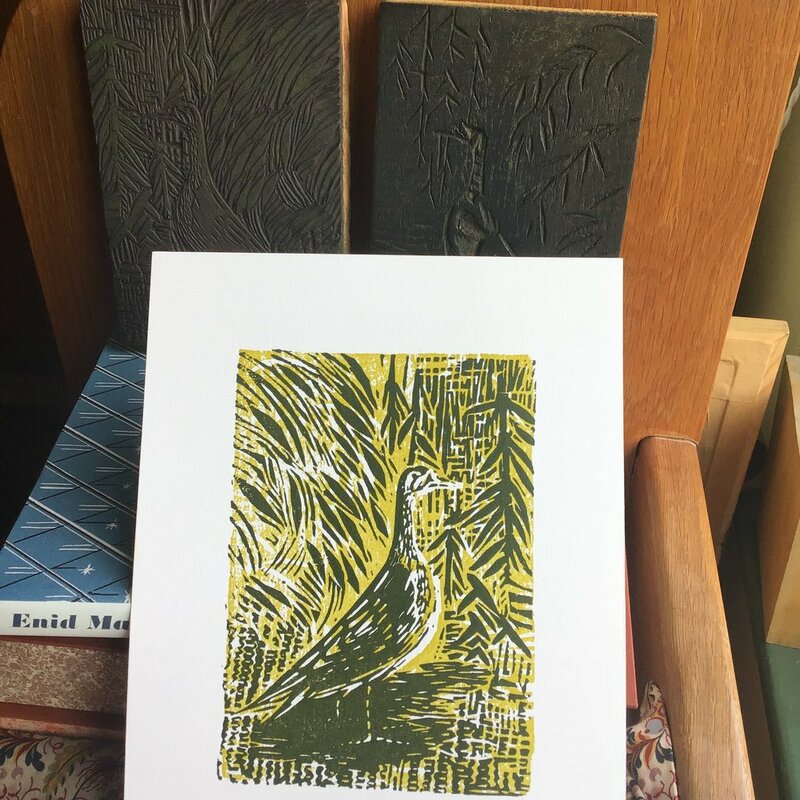 The background colour is cut into a piece of pine wood that looks to be an offcut from a window ledge, the detail image printed on top being a linocut. She gave these to me saying that they were too thick and no-one could print them except by hand impression, so I might as well have them and see if my new press could be adjusted to suit. 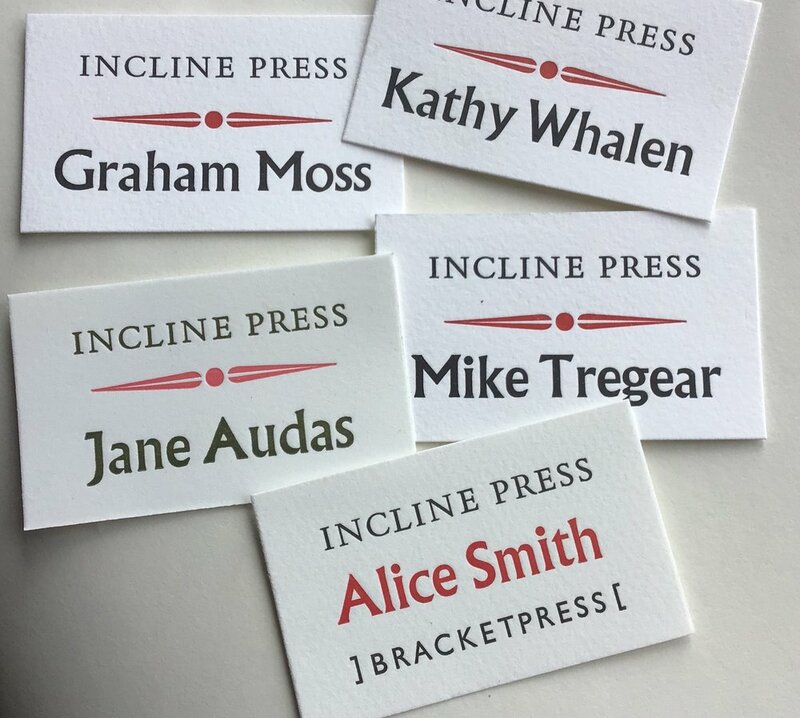 They are both about an inch and a quarter thick rather than the standard letterpress height of just under an inch, but everything can be managed, with care and experience. These have both been printed in editions of ninety copies to be sold through the shop at the House of Illustration. The price, and whether or not they will be available for online purchase, is unknown to me, but the exhibition is on all summer from the end of May, and you can see their publicity at Enid Marx: Print, Pattern and Popular Art. In the same vein, we are delighted to see that at long last a fine biography of Enid Marx is available. Lund Humphries have just published Enid Marx: the Pleasure of Pattern by Alan Powers, a well-illustrated account of her life and work that is a joy to read. We highly recommend it. As we say, available from all good bookshops if the bookshop is good enough.